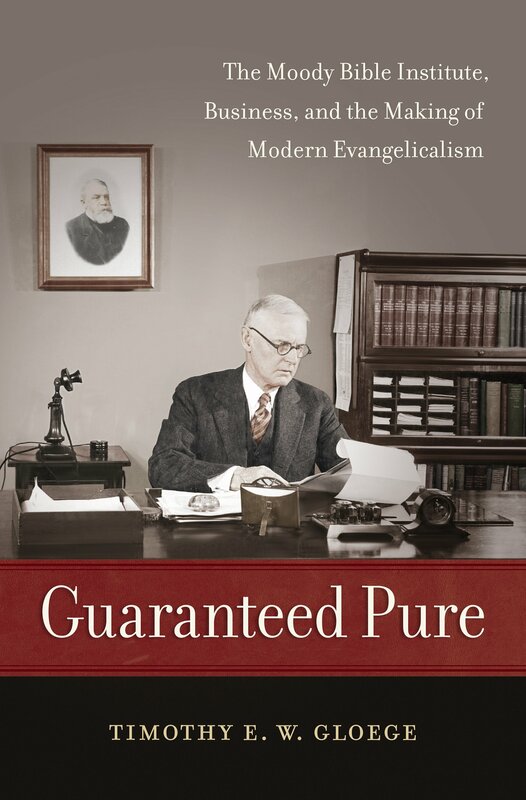 Guaranteed Pure: The Moody Bible Institute, Business, and the Making of Modern Evangelicalism, the new book by Timothy Gloege, is available April 27 from UNC Press. Several years back, I heard Tim Gloege give a conference paper on Henry Crowell, Quaker Oats, and American Fundamentalism at a meeting of the American Society of Church History. To this day, that talk stands as one of the smartest, most engaging papers I’ve heard presented at an academic conference. I know I’m not alone in looking forward to his book Guaranteed Pure: The Moody Bible Institute, Business, and the Making of Modern Evangelicalism, out this month with UNC Press. 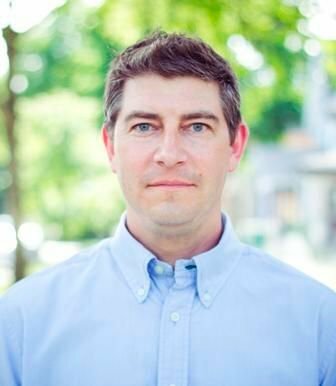 Tim is an independent scholar based in Grand Rapids, and he is currently teaching an online course for Calvin’s History Department. Here’s a sneak peek at his new book. KDM: In a sentence or two give us your elevator pitch for Guaranteed Pure. TG: Guaranteed Pure explains how evangelicals at the Moody Bible Institute created a modern form of old-time religion using business ideas and techniques. This smoothed the advent of modern consumer capitalism in the Gilded Age and Progressive Era and transformed the dynamics of Protestantism in modern America. What first led you to bring together evangelicalism, capitalism, and the Moody Bible Institute? The Moody Bible Institute (MBI) and evangelicalism have walked arm in arm since its founding in the late 1880s. MBI’s founder, the revivalist Dwight L. Moody, was integral to shaping the modern evangelicalism we see today. In the 1910s, after Moody’s death, its leadership was integral in drawing conservative evangelicals into the early fundamentalist movement. And in the interwar years it served as the institutional template for numerous parachurch organization devoted to “old time religion”—the alternative to liberal mainline Protestantism. So, MBI’s DNA pervades conservative evangelicalism today, and I thought its early history deserved a more thorough examination. Connecting this story to capitalism began with the observation that business people were seen everywhere in MBI’s early leadership. Some were lesser lights in the pantheon of Gilded Age business, others were lower level professionals. But a notable number were names familiar to business historians: figures like the president of International Harvester, Cyrus McCormick Jr. and Henry P. Crowell, the innovative president of Quaker Oats. Crowell especially wasn’t merely following the pack when it came to adopting modern business practice, he was leading the way. This in turn led me to ask why forward-looking business leaders would be attracted to a supposedly backward-looking religious system. Might there be resonances between MBI’s “old time religion” and the new business ideologies pervading America’s corporate boardrooms? This question challenged the prevailing notion that consumer capitalism was a secularizing force—that it was eroding religious adherence in the modern age. But in the end I was persuaded that the evangelicalism at MBI was not only compatible with modern consumer capitalism, but also uniquely dependent upon it. So, at a time when many Protestants were wary of modern business—Pentecostals, “plainfolk” evangelicals, and Social Gospellers—“corporate evangelicals” at MBI were using its ideas and techniques to transform the face of modern Protestantism. 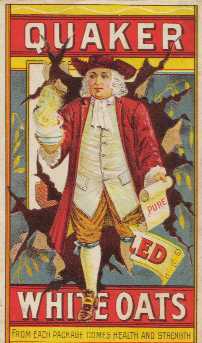 An early advertisement for Quaker Oats features the Quaker man holding a scroll with the word “Pure” on it. Tell us what Quaker oatmeal has to do with American evangelicalism? More than you might think. The founder and president of Quaker Oats, Henry Crowell, also served as president of MBI for nearly three decades. Business historians remember Crowell for his breakfast food empire built by transforming oatmeal-as-commodity, sold at the market rate, into Quaker Oats, the trademarked product sold at a premium. The key to his strategy was leveraging concerns over tainted food to prejudice consumers against the traditional open barrel. Then, using colorful packaging and massive promotional campaigns, he offered a sealed box emblazoned with a smiling Quaker as the wholesome alternative. At MBI, Crowell applied these same strategies to religion. He was concerned by the growing influence of Biblical higher criticism and other liberal “impurities” in mainline Protestantism. To combat it, he used the image of Moody as a religious trademark of sorts to promote a non-denominational Protestant orthodoxy, guaranteed pure. But much like Quaker Oats, this was an “old-time-religion” in name only. On many key points it was a radically modern “orthodoxy,” grounded not in doctrine or creed, but a personal relationship with God, a business-minded approach to reading the Bible, and saving souls. These same dynamics are at work in American evangelicalism today. The movement consists primarily in a network of independent churches and parachurch organizations that are structured like corporations. They advocate for an “orthodoxy” that is impossible to define or homogenize; rather it resides in a malleable set of attitudes, assumptions, and interpretations of religious experiences. This orthodoxy is validated either by charismatic leaders, or caricatures of historical figures and movements. And for every organization that might go under—whether by a change in leadership, irrelevance, or indiscretion—there are always new spiritual entrepreneurs to step in. It was this corporately branded system of “orthodoxy” that I argue MBI pioneered in the early twentieth century. Tell us about your favorite discovery in the archives. Hands down it was finding the correspondence files of The Fundamentals project sitting unprocessed in the Biola University archives. The Fundamentals, of course, was the twelve volume publication in 1910-1915 (funded by Los Angeles oilman Lyman Stewart) that initially rallied conservatives into a national coalition and which gave the resulting “fundamentalist” movement its name. These letters were the smoking gun of my argument. They show significant involvement of business folks, including Crowell, both in determining the function and contents of the publication. In fact, the whole idea of framing the publication as a non-denominational “orthodoxy” was Crowell’s idea. The project also borrowed from Crowell’s promotional techniques at Quaker Oats. The impression one gets when reading the publication is entirely different from what was going on behind the scenes. This wasn’t the broad, organically-formed, grassroots coalition of conservative academics and evangelical ministers we once thought. It was a carefully orchestrated project that was corporately structured and controlled. Well, there were a lot of moving parts in my analysis and so finding where (and how) to begin that analysis was the biggest challenge. Because I drew insights from a number of different historical fields, I had to deal with very different historiographical conversations taking place in the histories of labor, business, consumption, the middle classes, professionalization, social science, medicine, progressivism, and populism…not to mention religion. Negotiating the different terms that dominated these debates was a challenge. Consider, as one example, whether “modernity” is best characterized as individualistic or corporate. Historians of consumer culture treat individualism as a hallmark of modernity; historians of labor and corporate governance emphasize new group identities. Historians of fundamentalism treat an individualistic faith (i.e. personal salvation) as an old-fashioned alternative to the “modern” Social Gospel; some historians of liberal “spirituality” treat an individualistic faith as distinctively modern. Historians of science consider one of the revolutionary transformations of Darwin to be a shift from individual specimens to statistical populations; economic historians describe the shift to modern neoclassical economics as a new analysis based on rational, self-interested individuals. Combined, I think, these crosscurrents can be explained by dueling modernities—one rooted in modern consumer capitalism, one in modern science. But figuring out how to integrate these sometimes-incommensurate terms—and to do this without overwhelming the story with historiographical discussion—was tricky. Kevin Kruse’s One Nation Under God: How Corporate American Invented Christian America is coming out around the same time yours is. What connections do you see between your work and his? I’m still reading Kruse’s book, but I’m excited to see the connections. There’s the obvious chronological sense (his book begins where my book ends—at the cusp of the Great Depression). But I think it also applies to subject matter. Kruse’s story is about Protestant libertarianisms creating the construct of a “Christian America” to combat the New Deal. I explain how that Protestant libertarianism came to exist. Kruse rightly focuses on mainline ministers who participated in the project, along with later evangelicals like Billy Graham. But in my story, at least before World War I, it was primarily conservative evangelicals leading the charge to integrate their faith with the new free-market ideology. So if Kruse’s story is how business did political things with religion, my primary interest is in how business transformed religion. Your book and Kruse’s are not the only ones to examine connections between capitalism and Protestantism in American history. How do you explain this newfound interest? I think a lot of it has to do with a broader trend among historians of religion to integrate their stories into broader historical narratives. Certainly Jon Butler’s critique that religion in post-Civil War historiography acts as a “Jack-in-the-Box faith” influenced me in graduate school. And with the hegemonic influence of capitalism in modern society, it is only natural that historians would seek to connect it to their religious subjects. For scholars of evangelicalism specifically, I think the first wave of scholarship on the Religious Right highlighted the incongruity of associating modern business with secularization. There is a lot of ground left to cover, but fortunately we have some great work to look forward to from Darren Grem, Heath Carter, Darren Dochuk, and many, many others. You describe yourself as a “dabbler in digital humanities.” What have you been dabbling in lately? Well, I did some work in database development before graduate school and so I remain deeply interested in investigating ways to store, share, and analyze historical research digitally. But now that I’m teaching a course online I’ve been doing a lot of thinking about technology and pedagogy. Specifically I’ve enjoyed experimenting with ways of using technology to facilitate a more active learning experience. In my current course, I like to picture myself not at the front of the virtual classroom, but in the back: guiding each student as they learn how to think historically and “do” history for themselves. I become less a content delivery system and more of a coach. Have you started on a next project? I have a couple of ideas in the works. One is a biographical study of Reuben Torrey, an understudied but immensely important figure in the early fundamentalist movement (who also appears in the current book). A second project would retell the fundamentalist/modernist controversies from the modernist point of view. That is to say, I want to tell the story in a way that takes their religious beliefs seriously. Many historians unconsciously absorb the fundamentalist point of view, which considers modernists to be “fake” or hopelessly compromised Christians. On the other side, sympathetic historians treat liberal Protestants as proto-secularists, which tends to separate their ethics and reform from their “religion.” Both approaches distort what the modernists believed they were doing. In addition, my intimate knowledge of the fundamentalist side should also be an asset to tease out some of the nuances of the conflict. I’m especially interested in the ways that members of both groups cooperated before 1900 and understanding how and why this ended. Many thanks again to Tim for the interview! This entry was posted in Kristin Du Mez and tagged Ask The Author, book note, corporate history, evangelicalism, Fundamentalists, Guaranteed Pure, Henry Crowell, history, Moody Bible Institute, Quaker Oats, religious history, Timothy Gloege, US history. Bookmark the permalink.